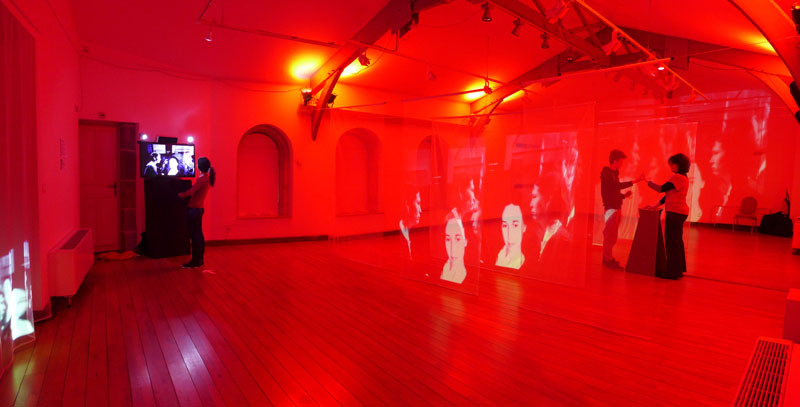 This artwork offers an interactive walking, visual and sonorous exhibition space. It creates original and interactive stagings of the spectators and invites them to question relationships of the other and their own bodies. 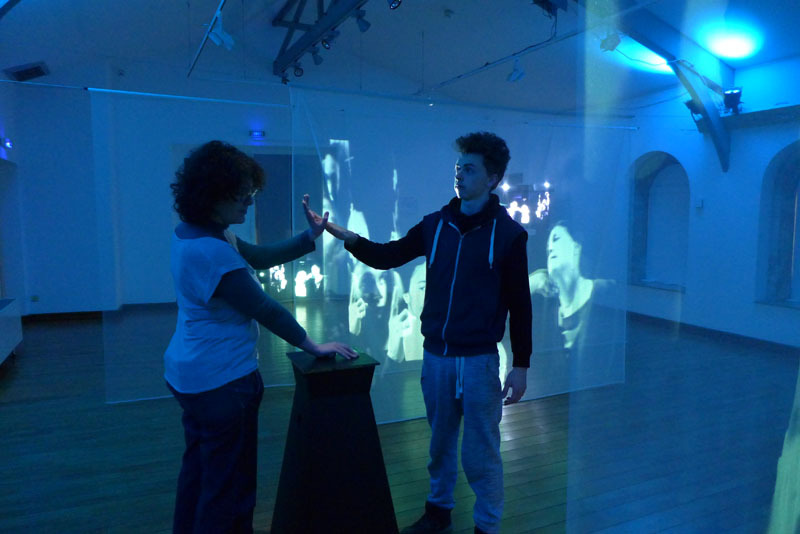 Real and virtual touch are intermingling and transforming the exhibition space. Different parts of translucent tulle are hanged along the exhibition space. 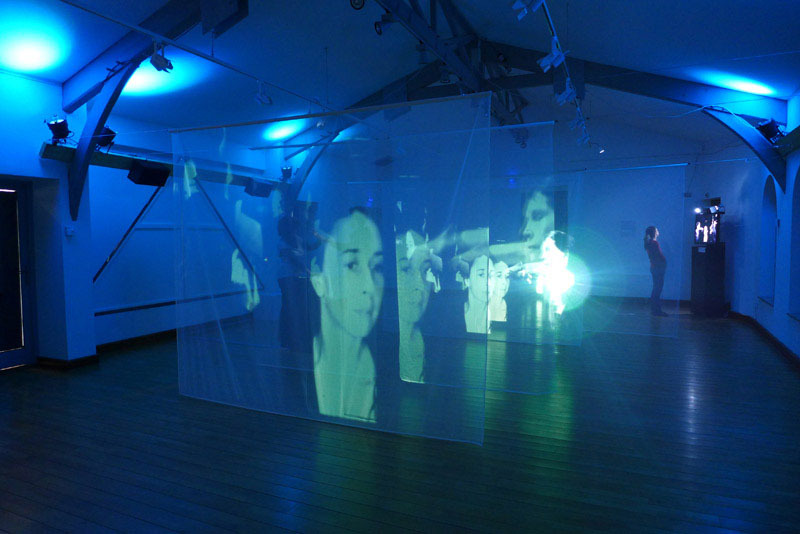 They are screens for video projection and also surfaces for the light. 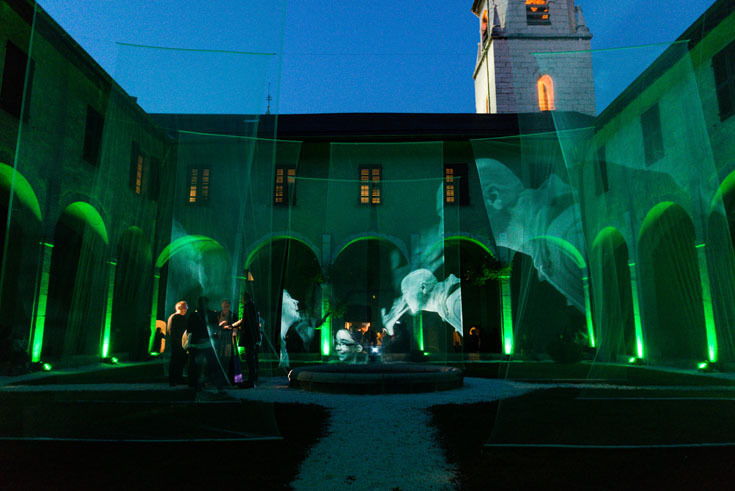 These translucent piece od fabrics allows to create transparency and layers of images. The RGB LED spotlights are oriented toward the ceiling and indirectly illuminate the space. When a visitor enters into the room he is facing to a mirror screen. This one reflects his face. 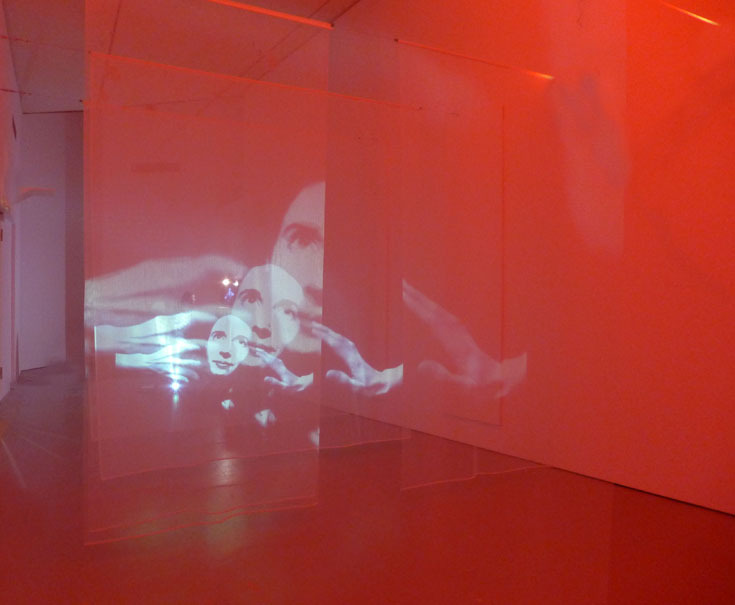 The reflection of the vieweris spreading in the exhibition space. 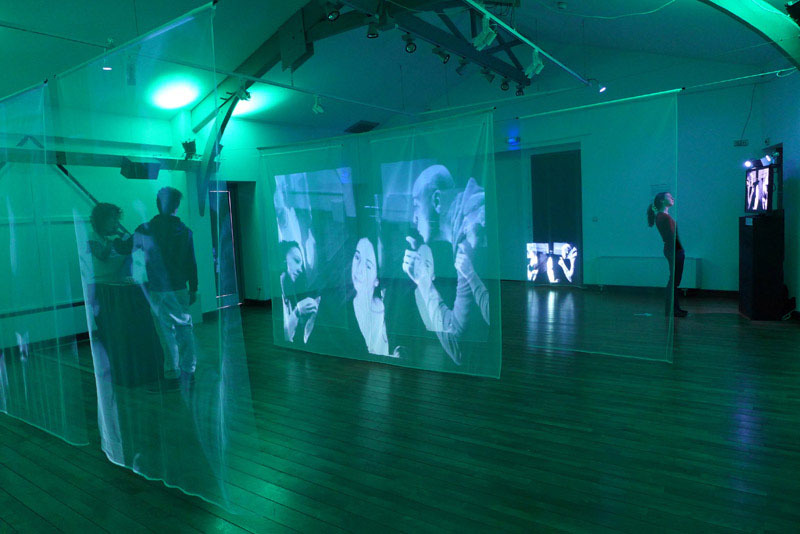 It is increasing across the mosaic of translucent screens spread across the room and growing as video projection distances. Virtual hands are trying to touch him, to catch him. These hands have lots of various behaviors and question relationships to the other. The hands feel the presence and move along the face of the viewer. When he goes away, the hands disappear. They will reappear with other behaviors when a new person will come. 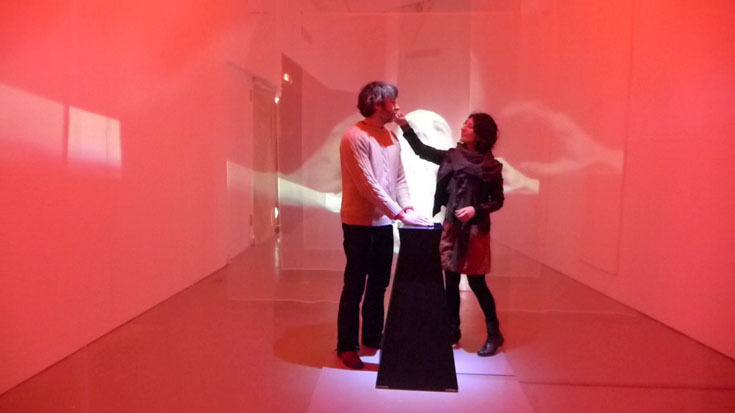 This work uses the interactive device of our artwork Rencontres imaginaires. In the centre, the meeting's workspace. The light and sound room pulse according to the rhythm of physical meeting between spectators. 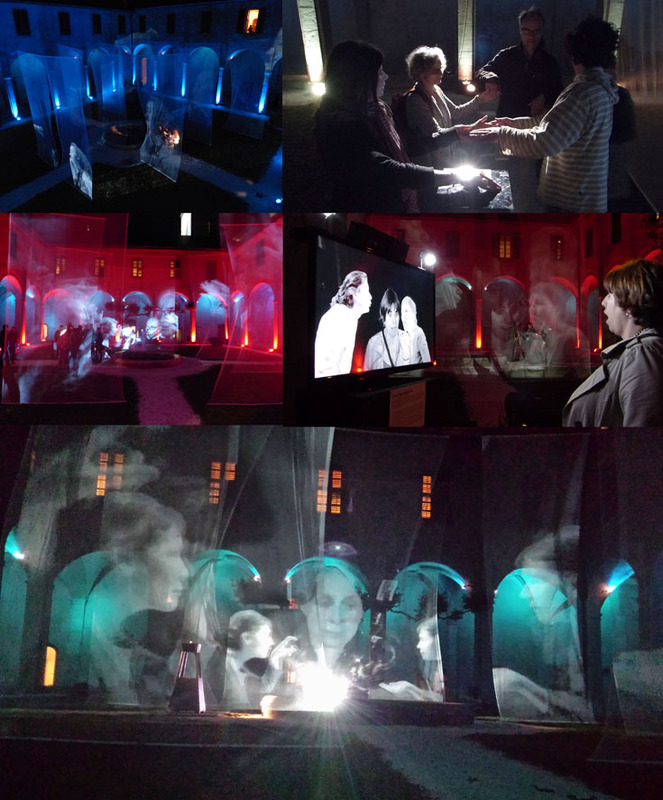 It uses the interactive device of our artwork Lights contacts. The centre of the installation involves physically body and skin of the spectators. This sensory installation is tactile, luminous and sonorous. It proposes an original and interactive stagings of the spectators’ bodies. They are transformed into real sonorous human instruments. In a poetic way, we invite the spectator to question the perception of the other. This artwork is composed of a small interactive shiny ball. A first person is invited to put his hand on the shiny ball. In contact with this object, his body turns sensitive and reactive to other living bodies. If the person remains alone, nothing happens, there is no reaction. He must invite another person to touch him. They must touch each other’s skin. For example, they can shake hands, caress or kiss each other. Each contact generates variable sounds and lights. The various sonorous vibrations change with the proximity of the contacts and of the spectators.